Day 1. MADRID - CORDOBA - SEVILLE (Tuesday) Departure from our bus Terminal at 8:00 a.m. southwards through the land of La Mancha to Andalucia. Arrival to Cordoba. City sightseeing tour, visiting the great Mosque, once the spiritual center of the Islamic world, with a Gothic Cathedral built inside and the Jewish Quarter. After the visit continue to Seville. Dinner and overnight accommodations. Day 2. SEVILLE (Wednesday) Half board in the hotel. Morning city tour visiting the typical Barrio de Santa Cruz with its narrow streets, the Park of María Luisa and Plaza de España, with a panoramic sightseeing of the city. Optional artistic tour including the Royal Alcazar Palace. Afternoon at leisure. Day 3. SEVILLE - RONDA - COSTA DEL SOL (Thursday) Breakfast. Then departure to the Route of the White Villages and Ronda. Free time. Continuation to Costa del Sol. Dinner and accommodations. Day 4. COSTA DEL SOL - GRANADA (Friday) Breakfast. Departure to Granada. 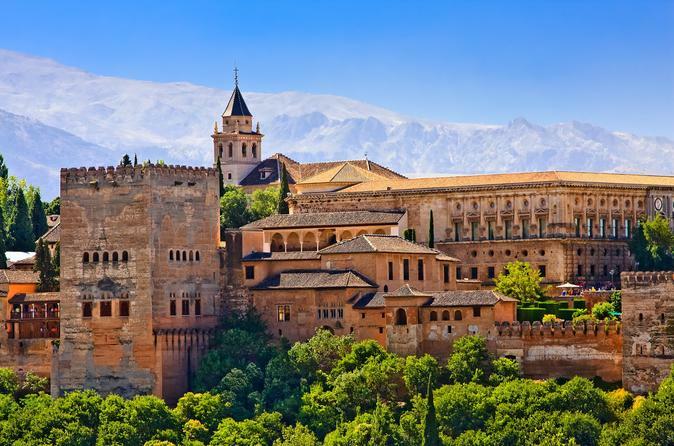 Sightseeing tour including the impressive Alhambra with its beautiful Nazari Palaces and the Generalife. Dinner and accommodations. Optional visit to the caves of Sacromonte and attend a typical show of gipsy flamenco. Day 5. GRANADA - TOLEDO - MADRID (Saturday) Breakfast and departure towards the Imperial City of Toledo, former capital at the kingdom, and impressive medieval city, totally preserved, raised on the top of the hill, full of history and monuments. Lunch and city sightseeing throughout its narrow streets and alleys. Continuation back to Madrid. Arrival and end of the services.